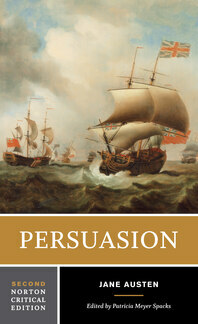 This revised Norton Critical Edition is based on the first edition text (dated 1818, but likely issued in late 1817). The editor has spelled out ampersands and made superscript letters lowercased. 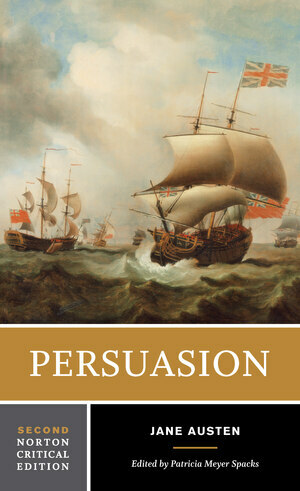 The novel, which is accompanied by revised and expanded explanatory annotations, is followed by the two canceled chapters that comprise Persuasion’s original ending. “Backgrounds and Contexts” collects contemporary assessments of Jane Austen as well as materials relating to the social issues of the day. Included are an excerpt from William Hayley’s 1785 “Essay on Old Maids”; Austen’s letters to Fanny Knight, which reveal her skepticism about marriage as the key to happiness; Henry Austen’s memorial tribute to his famous sister; assessments by nineteenth-century critics Julia Kavanagh and Goldwin Smith, who viewed Austen as an unassuming, sheltered, and “feminine” rural writer; and the perspective of Austen’s biographer, Geraldine Edith Mitten. The Second Edition emphasizes current critical scholarship, reflecting enormous shifts in our comprehension of Austen’s achievement and opening the door to new ways of thinking about Persuasion and its author. For the first time, we can think complexly about Austen living through the Napoleonic Wars on the Continent and experiencing their political repercussions at home—the same as everyone else in England at that time. Four new essays—by Linda Bree, Sidney Gottlieb, John Wiltshire, and David Monaghan—speak to these new perspectives; those by Gottlieb and Monaghan expand the conversation into film adaptations of the novel. A Chronology of Austen’s life and work, new to the Second Edition, is included along with an updated Selected Bibliography.